Disclaimer: Long blog!! For those who need to read in a hurry a list of the main points has been inserted halfway through the text! I’ve been in the US for four months and I have really immersed myself in the US market. This is mainly because all of my social media is directed around property investments. So I’ve had a lot of people in the US, especially in New York get in contact with me to tell me about what they’re doing in property investment, which has been so interesting. So, I wanted to highlight to you the key differences that I’ve found so far because I get it. There is a lot of opportunity in the US I’m definitely going to take advantage of that for the fact that we have been here. I think if you understand the differences, you can take advantage of that. The first thing is that actually commercial property for the most part is the same. Yes, there’s a slight difference in terminology, but everything is measured on a dollar per square foot basis. That’s how rents are valued. The investment value is exactly the same as we do it in the UK and around the world for that matter and the principal really is the same. So for anybody who is looking to invest in commercial real estate in the UK, for the most part, you’d be in safe hands in the US as well. Just remember to change pounds to dollars. Residential property, however, seems to be very different. The first thing is that higher mortgage rates are available over here, so you’re going to be looking at 4 to 5%. Yes, you can get lower mortgage rates, but there are so many hoops that you have to jump through if you want to get those and they are very specialist lenders that offer them. If you choose to go with that lender, then you need to go to interviews with that lender. They’re going to explain to you how you should manage your finances and what you need to do in order to keep up year after year with their requirements. As a result, that can take months. I’m talking 9 to 12 months for that mortgage to go through, which is unheard of in the UK. Usually it’s going to take 4 to 8 weeks. However, in the US, there are far higher loan to value mortgages. You can get 90% to 100% mortgages pretty easily. 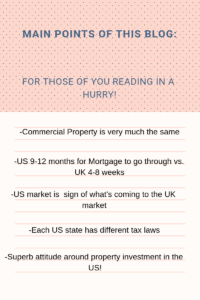 What’s happening in the mortgage market in the US is usually a sign of what’s to come in the UK market. I am sure over the next 12 to 18 months, we will start seeing 100% mortgages, or at least a lot of 90% products coming into play. But with that, we will see are interest rates going up as well, so keep an eye out. Just to make it simple, here’s some key points! The other thing is that there are far more opportunities for good deals in the US. There’s a lot of foreclosures where the bank takes control of the property or the bank is threatening to take control of the property so the owner has to sell, in which case you can get a good deal. Usually the you are going to be paying for the property, however much it’s going to cost for that owner to get rid of any debt that they owe the bank on the property. One major difference in the US is that different cities have different budgets. If they go bankrupt or they overspend for any reason, they’re going to be trying to sell off their housing stock quickly so you can get notifications for local auctions where a city is going to sell off their property and try and recoup some of the money. You can get superb deals on properties that way. There’s also higher returns because if you’re able to buy it low, you can then put a really nice modern spin on a property you can sell high, which is where the developers make a lot of their money. Of course the areas which are overpriced – Manhattan and Brooklyn to a certain extent – but there are still areas around New York and the rest of the country where you can get a good deal. Throughout my time in the US I realized there is a really great vibe around property investment. Everybody talks about it. If you say you’re in property investment, you are a prosperous individual. It’s really well respected and also people will lend easier over here. There’s also a lot more investors. All you have to do is have a positive conversation and they say, “wow, you seem like a trustworthy lady. I want to get involved with you”. And that’s a really open, honest way of doing property investment. There’s a lot less hesitation, there’s far more trust. This is mainly because those business relationships can be built very easily and people are more inclined to look at what you’ve got going on on social media and saying, okay, yeah, based upon those projects that I’ve seen, I will lend to you. Now of course there is a downside. In the UK everything that happens really revolves around one market. So we know what’s going on across the country and we have the same rules to follow. Over here in the US every single state has different tax laws – different ways in which real estate markets are happening. That can be really confusing and it’s something that I haven’t yet got my head around. So that is my findings so far! I’m wondering if you have seen similar – maybe you are reading this from the US and you have something else you want to add, or maybe you’re reading from the UK and you’ve got comments or questions about that you’d like to ask. Go ahead and comment below. I want to hear it from you! P.S. Don’t forget to sign up for the mailing list so you always know what’s going on in the world of property investment! ← Running My Business From My Handbag!